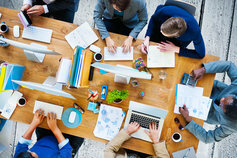 Effective Information Technology (IT) Strategy and Performance can help organizations ensure that their information systems deliver value, the unique risks inherent in technology are managed through appropriate corporate governance, and technology is used to support them in meeting their compliance requirements. KPMG's IT Strategy advisers can provide the means to define and implement an integrated plan of the technological infrastructure of the enterprise, which aims at best supporting the business strategy. Using a modular, business-oriented methodology and set of tools, we can help transform the organization's existing information management environment to achieve the desired business vision through a realistic and feasible information strategy plan. KPMG in Greece has developed a holistic approach to IT strategy and performance, which entails assessment, benchmarking, and planning elements that enable senior executives to determine how to materially improve their use of IT and enhance business performance. Communication - Establish clear and consistent communications between IS function and C-level executives. Agreement on objectives - Establish formal agreements between users and providers of information technology that are phrased in business terms and aimed toward the real user's business requirements. IT strategy - Develop a clear IT strategy that is in line with the business strategy. Policies, procedures and standards - Develop policies that address the procurement, development, and acceptable usage of IS, data security issues, and change management. Procedures and standards take policies to the next level by establishing practical means of determining that the IS function runs in a repeatable and understandable fashion. Performance management - Establish a system of measuring the IS function performance, so as to assist management in understanding how well the IS processes are running. When established at realistic levels and communicated appropriately, performance standards and metrics give employees a clear definition of expectations and a goal to work towards. Risk management - Develop a rigorous risk management process that helps enable a business to identify and understand risks associated with IS that may have a negative impact. Project management - Due to the constant quest to improve technology, a number of major projects are frequently underway within IS at any point in time. Good project management assists the organization in implementing projects that are in scope, within time and cost constraints, of sufficient quality, and able to be integrated to the applicable business processes and related systems.